A second peanut allergy friendly White Sox game has been scheduled for Friday, July 6, 2012 at 7:10. The game is against the Toronto BlueJays. Tickets are $47 and there are about 200 seats available. Hurry--these seats will go fast! Thanks to Judy Thompson and Jenny, of the Nut Free Mom blog, for alerting me to the exciting news of a second White Sox game! And thank you to the White Sox for making these accommodations! Check out this newsclip about the peanut free games at Pawtucket's McCoy Stadium. 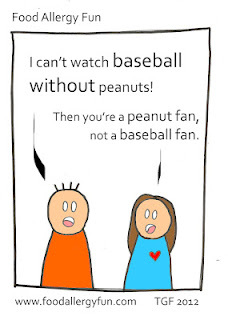 The other day, I asked Tiffany of Food Allergy Fun if she might consider doing a cartoon about peanut free or peanut allergy friendly baseball. I think Tiffany's cartoons are so clever and so deserving of attention! I was thrilled she said yes, and here it is! Thank you so much, Tiffany! Please visit Tiffany's blog, Food Allergy Fun, where she has many other excellent food allergy cartoons. She's also on Twitter -- @iknowtiffany. I think Tiffany's going to be famous someday. Did you know this is the Whitecaps 10th year offering peanut free games? Wow! Hats off to the Whitecaps! Please take a look at this funny little video about the upcoming May 9 and May 10 peanut free games. 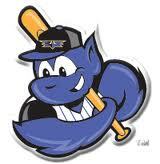 Family Allergy & Asthma is sponsoring a peanut free night for a Louisville Bats game on Monday, May 7. What a great tradition! The game starts at 6:35 PM. For more information, click here. Thanks to Family Allergy & Asthma for sponsoring the game and for sending us the information!